I’m not sure what GPA I had when I graduated college. My relationship with classes and grades was quiet defiance: I never deliberately did poorly in a class, but I also made no efforts to do well if I wasn’t interested in the subject matter. I wasn’t spending that time playing video games or binge drinking (entirely). I was mostly putting off class to work on projects that were more fun and challenging. Challenges that held my interest better than a monotone man in business casual reading off a powerpoint. I didn’t realize it consciously at the time, but I was making a choice to focus on skills rather than grades. I was developing abilities through practice that college aims to teach through classes, and doing so much faster and more effectively. Skills that let me take a lead marketing role in a startup post grad, start my own business, and soon transition to working for myself. My hope is that by the end of this article, you’ll be on board with the idea that grades really don’t matter all that much, and so long as you’re ignoring them to learn things other ways, you can safely stop caring about them. If you want to escape from the GPA mindset, you might also like my free 7-part masterclass on teaching yourself anything. 1 and 2 are hard to argue with. Everyone wants the best opportunities possible post graduation, and the best opportunities are going to require some indication of your ability to excel at them. What we want to dig in on is whether or not 3 is true: is GPA a good indicator of ability? Let’s say that as you’re reading this essay, finding yourself nodding along to this Nat guy’s logic, you’re struck with a sudden and debilitating pain in your chest. You tell Siri to call you an ambulance (I assume she can do that, though let’s not test it), and once you’re wheeled into the hospital, you’re approached by two doctors. The first doctor, Scipio, says he has treated dozens of patients like you and knows from his experience what is likely causing the problem and how to treat it. There may be some surgery involved, but he’s done the surgery dozens of times and assures you it’s always gone smoothly. The second doctor, Vronsky, explains that he has taken many classes that touch on this kind of chest pain. When tested by his professor, he received high marks, the top 10% of his class. He hasn’t done any related surgeries before, but he’s been fortunate enough to be able to watch some private internal videos on how to do it (most likely filmed by Skippy). Which doctor would you prefer to treat you? Assuming your head is screwed on properly, you should prefer Scipio. His experience with handling this problem makes you feel much more secure trusting your life to him than you do trusting it to the well studied, but inexperienced, Vronsky. Now, let’s tweak the hypothetical. What if instead of being presented with the reassuring Scipio, you met Vronsky as well as Dominique. Dom tells you that she went to the same school as Vronsky, and while he was only in the top 10%, she was the top of her class. Vronsky watched videos, but Dom sat in and asked questions of the surgeries, enough to earn her a strong letter of recommendation from the head surgeon. She, too, has no hands-on experience, but given the options of Dom and Vronsky, you’d likely go with Dom, despite your nagging wish for a doctor with some real experience. What you experienced being wheeled around in my imaginary hospital is the same set of tradeoffs most companies have to make when looking at college students. They’re hiring for some role, and while they would love to get a student who already knows how to do the things they’re hiring them to do, they’ll settle for the student who got the best grades if they must. Grades are an indication of ability, yes, but only as a fallback in the absence of real demonstrated skill. The second problem with grades for demonstrating ability is they’re only secondary indicators. Imagine a writing class. The quality of the writing you produce is the primary indicator of your writing ability. Your grade in that class is a secondary indicator. Between reading someone’s writing, and seeing what grade they got in a writing class, obviously, seeing the writing would be a more useful way to judge their skills. Or, think of Maya Lin who received a B on her proposal for how the U.S. government should design the Vietnam War Memorial, but then won the competition, even beating her own professor. What’s the better indicator of her skill? What she designed? Or the grade she received? Given the option, it’s better to evaluate people on primary indicators. How good is their writing. How good are their designs. How clever are their algorithms. Where secondary indicators become useful is when a company is so big that they can’t take the time to assess real skill level, or when the job is such where you don’t need any real skills in the first place. GPA gives these companies a quick and dirty way to weed people out at career fairs, or to evaluate people when the interviewer is just as clueless as the interviewee. Secondary indicators always pale to the primary source. A grade is less reliable than what you’ve done. A news report is less reliable than a video of the scene. A book summary is less reliable than the book. Grading appears to have started, in the U.S. at least, at Yale in 1785 when the president divided the 58 graduating seniors into four categories: Optimi, Second Optimi, Inferiores, and Pejores (roughly translated as, “the worst”). It was not an objective assessment of their ability, rather, a comparative ranking among the members of the class. 20 were the “Optimi,” the best, and 10 were the “Pejores,” the worst. You’ve likely experienced this as “grading on a curve,” in which a professor distributes grades along a bell curve, where the students who did the best get As and Bs, and the students who did the worst get Cs and Ds (though, colleges grade inflate so much that the best students get As, most get Bs, and then maybe the bottom 10% get Cs). They couldn’t (accurately) says “ah, Betsy got a 4.0, so she must be a skilled accountant” because a grade doesn’t tell you anything about the recipient’s skill level. If you had a class of exceedingly hard working and intelligent students, you could have someone with a C be superior to a student from a competing university with an A in a similar class. At the same time, if the class was poorly run and no one learned anything, everyone could get an A despite learning nothing. Someone with a high GPA in marketing classes is not necessarily good at marketing, we can only say they are good at taking marketing classes at their university. And this is why grades are so problematic. We treat them as indicating someone’s ability in an area of study, or how intelligent they are, but they’re only an indicator of your ability to do well in classes at your university relative to your peers. And in most colleges, at least half of that is someone’s skill at gaming the system and creatively cheating. By focusing on getting a good GPA, you get an inaccurate, secondary indicator of potential skill at something instead of actually getting good at it. You end up as a Vronsky or Dominique, instead of a Scipio. And while it may feel like school forces you to be in the GPA mindset and play by their rules, there’s another, less adopted way to look at your education. It’s called the skills mindset. In the Skills Mindset, you focus on demonstrating your ability through practice, projects, and experience, instead of trying to jump through hoops for grades and accolades. This works for any field you could want to go into (barring, maybe, academia). Even if you’re reading this and thinking “I want to be a professional dolphin trainer, how does the skills mindset apply to THAT?” there is always a more skills-mindset way of demonstrating ability than grades. Sure you can’t buy a dolphin to practice with, but what if you went to the local shelter and trained rescue dogs? If you can focus on practicing and developing real skills and getting results, instead of trying to get good grades that may or may not indicate your ability, you’ll have a much more accurate and objective measure of your ability, and one that you control, without relying on the approval of some hungover TA grading your last paper. Anyone looking to hire someone would prefer to see that they’ve actually done something than that they’ve studied something. This only gets missed by so many college students because they’re never exposed to it as an option, or they (wrongly) assume that they can’t teach themselves new skills while still a student. But shifting how you learn and demonstrate ability isn’t enough. The Skills Mindset also requires that you approach work and jobs differently. When you’re relying on your GPA to get you a job you’re asking employers to take a chance on you. You’re applying to roles that are designed for recent college graduates, because you don’t have much experience to go off of. This is what the college career fair was designed for. It’s an extremely familiar process (eerily similar to the one you went through to get into college), that allows students who focused on their grades to get roles at companies who don’t need someone with an existing skill set. If you’re using the Skills Mindset, a career fair is the last place you want to look for work. Career fairs are not designed around people who have skills and experience, they’re designed around the hyper-competitive GPA game where you’re fighting tooth and nail with your peers. The good news is, by focusing on a skills mindset, you have access to avenues for employment that most of your peers won’t. By focusing more on developing skills that you can market, you can go in for more experienced positions than students stuck at entry level roles. You could be an early employee at a startup, take on a higher-ownership role in a larger company, or even work for yourself. Most importantly, you’re not reliant on the jobs that come to you (via career fairs), rather, you have access to whatever jobs you want to go after. You could find those opportunities by going on the websites of companies you’re interested in, perusing sites like AngelList, or simply reaching out to people you respect in your field. You aren’t limited to the companies that are looking for college grads, you get to approach companies that just want someone who can do the thing you know how to do. And when you develop skills and use those to get work, you’re showing whoever you’re working with that they are making a smart investment by hiring you. You can show the amount of value you bring to their project, and instead of asking them to give you something, you’re telling them what benefit they get in hiring you. Better, by focusing on your skills and approaching work this way, you’re much more able to say no to work you aren’t excited by. You’re in a less risky position because you have the negotiating power and can go after opportunities you want, instead of shotgunning out resumes begging companies to accept you. This shift has to happen at some point in your life. Once you’re 2, 5, 10 years out of school, you can’t rely on your grades anymore to get you a job, and you have to rely on your abilities at whatever you’ve decided to master. All I’m suggesting is that you make that shift now, and skip the GPA mindset entirely. In the GPA mindset, you’re in a brutal competition against your peers, but in the skills mindset, there are significantly more opportunities and you don’t need to “beat” anyone you know. 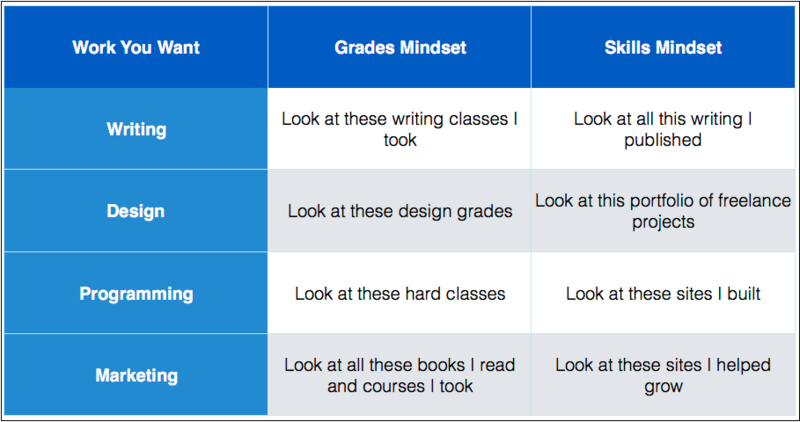 In the GPA mindset, you’re hoping you don’t get screwed over by a hard grader, but in the skills mindset, your practice and production speaks for itself. In the GPA mindset, you have to do a ton of stupid busy work just to get the A, but in the skills mindset, you only do what work is going to contribute to you developing your skills. If you can develop the skills mindset and focus more on “getting good at stuff” than on “getting good grades on stuff,” you’ll be less stressed as a student, have significantly more work options post grad, and likely end up having more fun work too since you’ll be doing something you care about. Maybe you want to be a great writer, artist, comedian, photographer, whatever it is, focus more on that skill than the specific job. Especially early on in college, your time will be much better spent getting good at something than tricking yourself into thinking you know what job you want post grad. And what you’ll find is that as you get good at a skill, the job opportunities abound. There’s no shortage of students with good grades, but there’s a massive shortage of students with marketable skills.